All of us love crocus, daffodils, tulips, hyacinths, and so many other bulbs that are early harbingers of spring. Dreaming of flowers to come, in autumn we have no trouble finding time to plant new bulbs for next year. There are, however, four seasons to our gardens, and when the spring bloom is done, it’s time to think of bulbs we can plant in spring for beauty during the rest of the year. Let me take a step back and say that many catalogs and gardeners use the term “bulb” to refer to corms, tubers, and rhizomes as well as true bulbs. These little storehouses all serve much the same function: housing and protecting the buds, or eyes, for the growing season to come as well as storing energy for growth during stressful times…and the more a plant does for itself, the happier this lazy gardener is. Hence my love of spring-planted bulbs. Who can resist the glorious iris? Photo © Kate Rowe. After the carefree and abundant blossoms of spring, look around your yard for empty spaces that need filling: it’s time for spring-planted bulbs to the rescue! Do you need something tall in a sunny spot? Try iris, day lilies, gladiolus, crocosmia, dahlias, or something really different: bletilla, a.k.a. ground orchid. Bletilla striata can last for years in our Long Island gardens and will grow to be 16” tall. Many gladioli also survive winters in our gardens, thanks to global warming—every cloud has a silver lining! What’s that you say? You will happily plant iris or day lilies, but not dahlias? You don’t want to grow big, beautiful, colorful dahlias because you don’t want the hassle of digging up the tubers at the end of autumn? Well then, don’t! With the affordable price of bags of dahlia tubers at big box stores, just forget about digging them up. Those abandoned tubers will enrich the soil…That’s my story and I’m sticking to it! Do you have a shady area in need of help? Consider planting carefree variegated Solomon’s seal. Its arching stems are beautiful, and the shy green-tipped white flowers that appear under its leaves in late spring are a lovely bonus. This gardener can assure you that if Solomon’s seal is happy, it forms lovely large clumps with virtually no help. So it’s one of my favorites; I’m a lazy gardener, remember! Do you need late garden color? 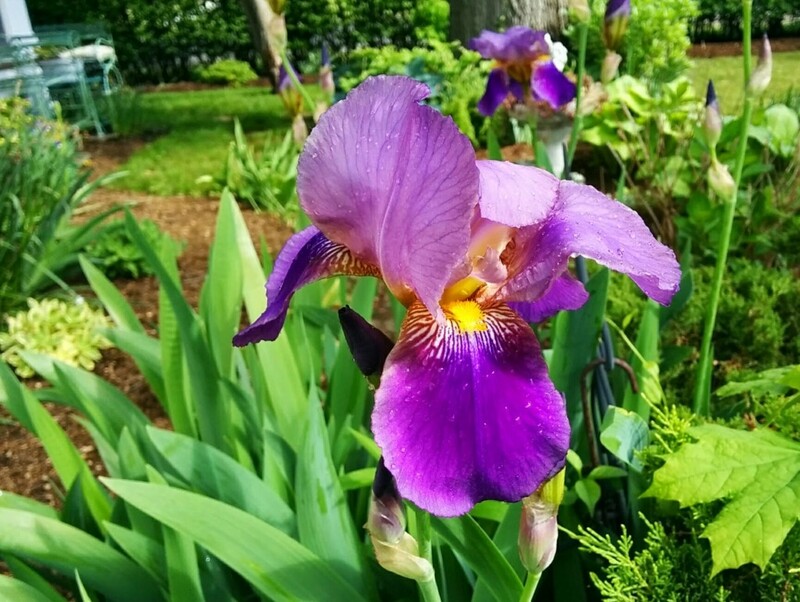 Check out re-blooming iris, canna, of which there are now some shorter varieties, and caladium which blooms throughout the summer until the first cold days of fall. And did I mention dahlias? See above for the lazy gardener’s take on these beauties! For specific advice on using bulbs successfully in your garden, read this CCE Suffolk fact sheet on Summer Flowering Bulbs. I’ve concentrated here mainly on perennial flowers (as any card-carrying lazy gardener would) but many bulbs can be planted as annuals to provide a world of beautiful color in Long Island gardens. For the most part, these bulbs are no more expensive than a 6″ or 8″ pot of geraniums, and in general much more carefree, so give them some thought as you plan for summer and autumn color in your garden, on your patio, or in your pots. Not sure how to plant and nurture these bulbs in your garden? There’s an easy way to learn: Check out this Flowering Growing Guides list of plants from Cornell, which includes many of these bulbs. Once your bulbs are planted, sit back with a cool drink and relax while they make your garden look beautiful! Kate Rowe is a lazy gardener and Master Gardener Volunteer from the CCE Suffolk class of 2014. She can be reached at rowekb@gmail.com. This entry was posted in Flower gardening, Long Island gardening, Master Gardener Volunteers, Uncategorized and tagged acidanthera, anemone, begonia, Bletilla striata, bulbs, caladium, canna, colchicum, corms, crocosmia, dahlias, day lilies, elephant ear, freesia, gladiolus, iris, lazy gardener, lily, ranunculus, rhizomes, Solomon's seal, summer flowering bulbs, tirgridia, triteleia, tubers on May 14, 2016 by Robin Simmen.